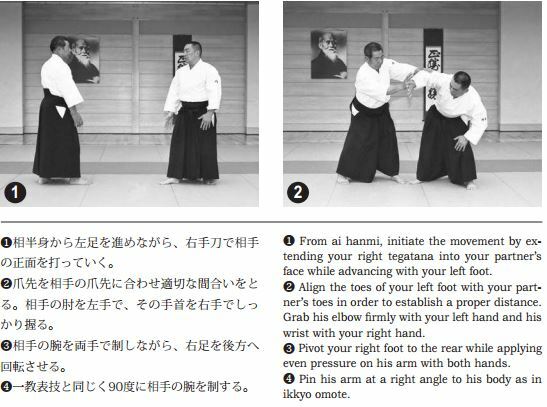 In the below video Morihiro Saito Sensei (9th Dan) demonstrates the Aikido technique shomenuchi ikkyo (omote and ura). In the demonstrated technique, which is based on The Founder’s instruction in the text “Budo” (1938), the nage initiates the application by applying a vertical strike to the face of the uke. Pinning techniques are referred to as osae waza in Aikido practice. 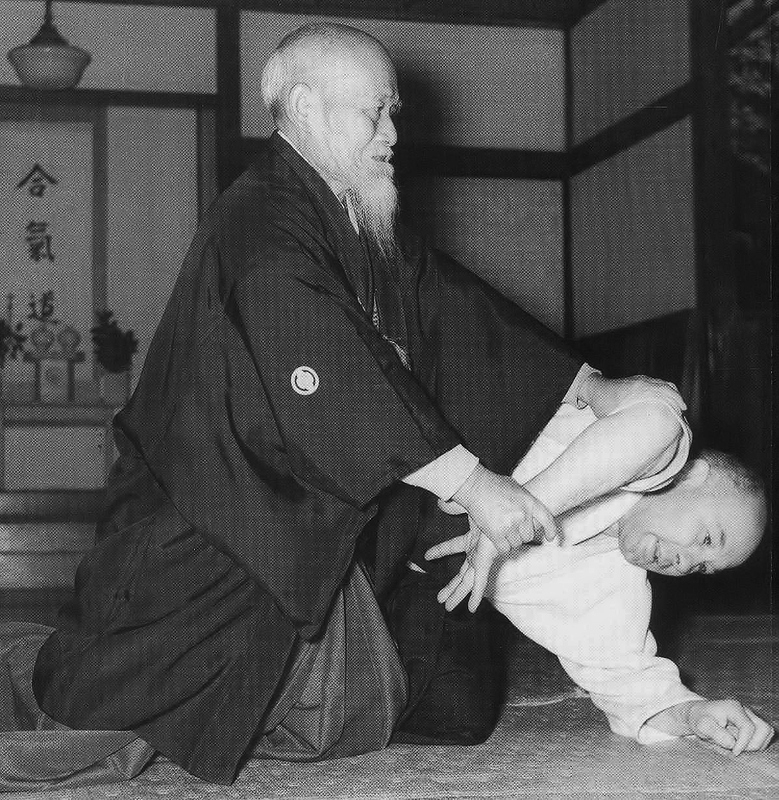 Ikkyo is the “first technique” in osae waza. Shomenuchi ikkyo (omote) – Takemusu Aikido Vol 1. 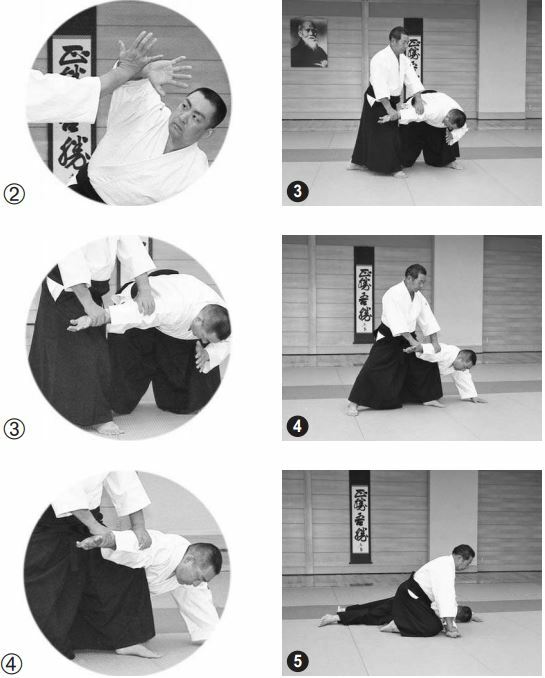 In the below pictorial demonstration, Morihiro Saito provides instruction on the basic omote application of the technique. Notably in the basic application the nage strikes first. 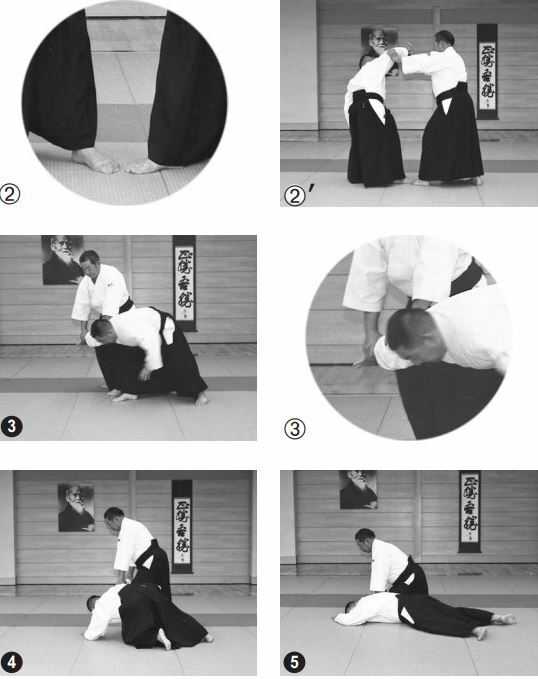 In the below pictorial demonstration, Morihiro Saito provides instruction on the basic ura application of the technique. Notably in the basic application outlined below the nage strikes first. 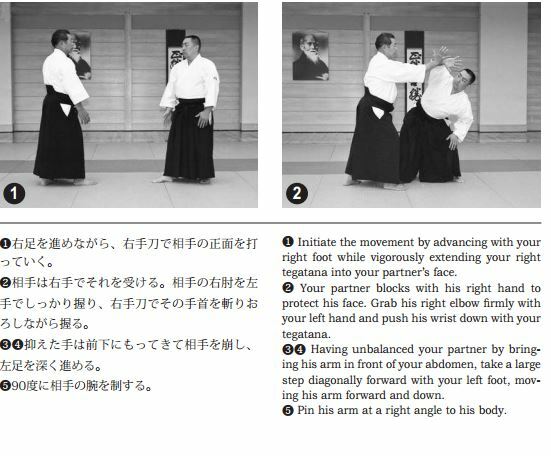 However, the basic ura version is also able to be applied if the nage initiates the strike first. In the Founder’s 1938 manual it states “When your opponent strikes first with shomen, turn around the attack with irimi tankan, use your right hand to receive the blow and then control your opponent as described..”. The pin for this technique is often seen done with a form of nikyo pin. This is not in fact the correct pin. 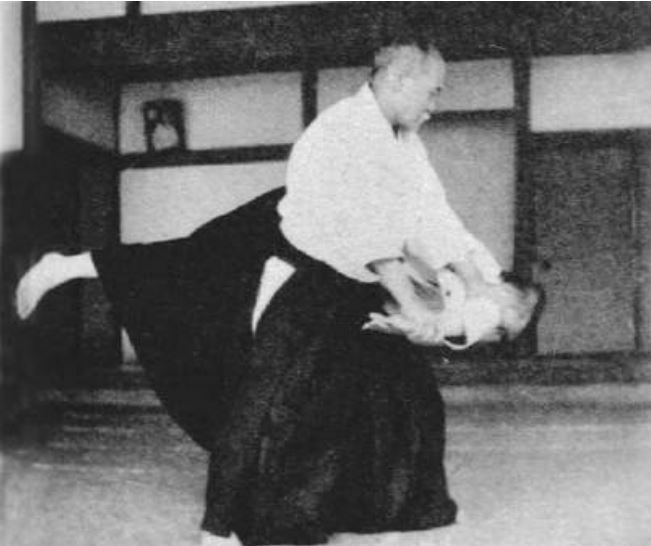 In the below picture, O’sensei demonstrates the pin for shomenuchi ikkyo. 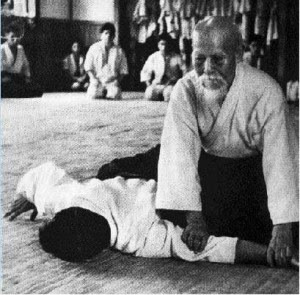 In his 1933 text “Budo“, Master Morihei Ueshiba (O’sensei) also states that “when pinning your opponent to the ground it is essential that his arm be at a right angle to his body” (see picture). The uke’s arm remains horizontal in the second part of the technique. The uke’s hand should not be higher than their shoulder or vice versa. The uke’s arm always remains in front of the nage’s centre. This is the case regardless of whether the technique is performed standing or where uke and nage are both kneeling (suwari waza). In the following video Chicko Sensei uses the sword to demonstrate the footwork for entering for omote applications in (ki no nagare) free flowing practice. Ura footwork is also explained. In the below video Chicko Xerri Sensei (6th Dan AKI Aikikai) provides instruction on some of the key Aiki principles that underpin practice of Shomenuchi ikkyo for free flowing practice (ki no nagare). Our dojo is part of the Fudoshin Australia Group of dojos operating under the guidance and mentorship of Chicko Sensei. The technical aspects underpinning dynamic practice of shomenuchi ikkyo are further explored in the below instructional video featuring Yoshimitsu Yamada Sensei (8th Dan Aikikai). The uke is a young Donovan Waite Sensei (7th Dan ). In the below video students from our dojo demonstrate an application of the technique where the elbow is used by the nage to strike and take the initial balance of the uke. In the below video Chicko Xerri Sensei explains the Aiki principles for shomenuchi ikkyo when it is practised from zagi waza/suwari waza (ie where both nage and uke are kneeling).